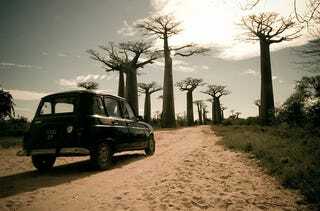 The Renault 4 may be a weird little French hatch but Madagascar’s native trees have got it beat: they grow upside down. For the rear-wheel drive purist, Renault’s 4, their first front-wheel drive family car, is upside down enough, but it’s fairly conventional compared to these Grandidier’s Baobabs (Adansonia grandidieri), the bizarre trees which line this road, Madagascar’s Avenue of the Baobabs. They are but one of over 8,000 plant species native to Madagascar which grow nowhere else on Earth. Driving along this road, I suspect it’s maddeningly hard to resist the impulse to do a vertical 180 in the driver’s seat, operating the pedals with the hands and steering with the feet. A very unwise impluse: A. grandidieri have trunk diameters exceeding 30 feet. And the widest part is, of course, at the bottom.